The most helpful action when feeling overwhelmed is to make a list. Lists do many good things for our psychology, memory and camaraderie if working with others. Any kind of list will do, but writing them by hand is often best. In all cases, it’s worth remembering the adage: Make a List. 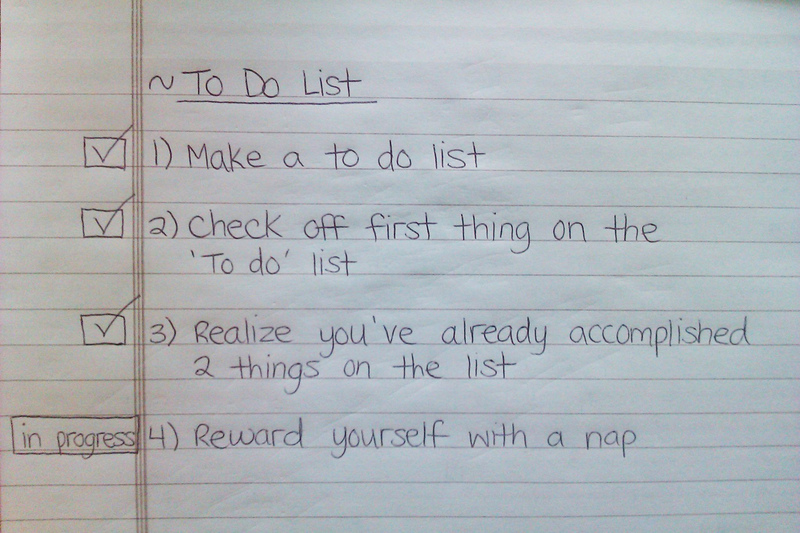 When in doubt, just make a list. Sit down, shut up and start writing. Perhaps you need a list of questions, a list of problems or a to-do list. Maybe you need a list of lists! The sooner you get started the sooner you’re realize how many lists you need. Many projects, despite how complex they seem, simply need someone to stand up, go to the whiteboard, and make a list of what’s wrong, what’s missing, what remains to be done, or what the major problems are. We often allow ourselves to believe that we’re so sophisticated that if we’re having trouble, it must require a complex method to save us, but that’s often not true. A well written list is often the fastest way out of many problematic situations in work or in life (remember, everything in life is a project) . No matter how big the list is, everyone feels better once the list exists. Hey! You made something! Change of mood or mind starts with small things. Once there is a list, pivotal questions can be asked: what should be done first? what’s hardest to do? Which thing isn’t understood well enough to know what to do with it? It can take hours to debate which things are more important than other things, but once you have a prioritized list you get magic powers: simply by always working from the top down you are guaranteed to always be working on the most important thing, no matter how much work you get done, or how long your list becomes. This means you can stop worrying about the bottom of your list, or how long the list is. With an ordered list, you can divide between things that must be done (Priority 1) and things that are good, but you can survive without (Priority 2). It can take much thinking to divide a list this way, but once you do, you have clarity. You give yourself the power to say NO to many things, creating space for the priority 1 things to be done well. You know you should not be working on Priority 2 items until all of the Priority 1 items are finished. When in doubt, make a list. You’ll feel better, I promise. Jason Crawford June 12, 2013 at 11:32 am. Permalink. Great advice—so useful in part because it’s so simple. I do this all the time. Another simple, but related technique I learned from Jean is just to start writing your thinking process down, in full sentences, like a diary or journal. Amazing how much faster you get to clarity, especially when you’re overwhelmed. These techniques are like shifting into low gear: you don’t go as fast, perhaps, but when you’re going uphill it’s the only way to make progress and not get stalled. Scott June 12, 2013 at 1:16 pm. Permalink. Thanks Jason. Keeping a journal has had many profoundly positive effects on my life. It’s one of my most important habits. Chris June 12, 2013 at 4:49 pm. Permalink. Great points Jason and Scott, when I’m overwhelmed, I get out my ever-present journal and write the list, then prioritize, then act. It’s great to put things in perspective, and the journal makes it easier to review weeks or months later to see what you missed and how unimportant some of those urgent, worry-some things really were. Smaranda June 13, 2013 at 4:03 am. Permalink. “You’ll feel better, I promise.” True story. Lynne June 14, 2013 at 11:11 am. Permalink. So agree: List making is simple but vital. Whenever I start to get ‘overwhelmed!’ palpitations I immediately grab a Sharpie and a pad of Post-its and start unloading all my tasks onto them. I love Post-its because I can then group, stack and re-order them by priority. Because I’m a massive ‘List Geek’ I usually then jump into Evernote (with it’s handy checkbox maker) and record it there, so the list is available across all my devices. I feel like the simple act of just getting things out of my brain somehow reduces the anxiety around them, and checking things off is also powerful. Ari July 1, 2013 at 10:42 am. Permalink. You might want to take a look at Trello (trello.com). Sort of a digital version of your post-it system, with all the grouping & sorting you mention, plus more features that paper can’t provide. Also available across all your devices. Alys Longworth June 17, 2013 at 10:33 am. Permalink. Great blog! I am a first time commenter. I’d like to heartily recommend Atul Gawande’s The Checklist Manifesto: How to Get Things Right. It delves into the details of this idea and how it helps us all manage our work with greater efficiency. Atul Gawande is a terrific writer (through lots of practice, by his own admission) and a contributor to the New Yorker etc. Scott June 18, 2013 at 8:48 am. Permalink. Scott December 26, 2013 at 10:35 am. Permalink.